Someone asked Apartment Therapy how to make their home comfortable for visiting children. Amateurs! Even when I lived with roommates I always made sure my nieces had toys and books to read. Now that we own a home? Pack and play, changing mat, high chair, toys, books - heck we even have bath toys and Aveeno for Babies stocked. Of course I've always spent time with kids and love thrifting! Thrifting whilst volunteering. That green mug is a Starbucks mug; I hadn't found one of those in a while. The 1977 book is for my husband to flip through because he was born that year. The basket is to replace the one I bought last week which was too small. This is the third time I buy this guy. He was part of that farming set my older niece decided to keep and also part of the set I craigslisted earlier this summer. Oddly enough that blue thing switches hands. Those gift baskets I have to assemble are for this Friday. 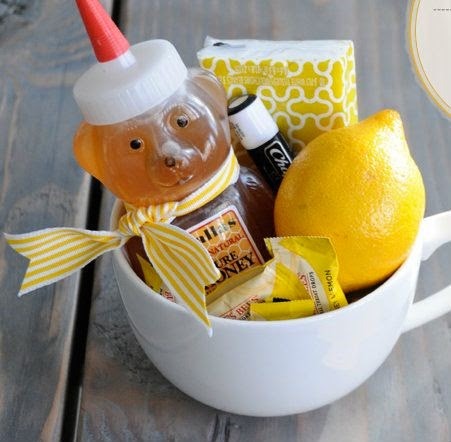 I googled around and like this blogger's get well soon basket. Remind me to buy two lemons or limes tomorrow! I picked up a pair of honey blend bears from Rite Aid. They cost $1 but with my 20% buy way too much stuff discount they only cost .80 each. That's because the honey is mixed with corn syrup.